How to dial in the right propeller for your boat. The right propeller will place the engine within its prescribed operating ranges at wide-open-throttle where the outboard motor delivers its rated horsepower. Too often, dialing in the right wheel is regarded with the same sacred awe that not long ago was fawned upon the wizards of 35 mm photography and personal computers. When in fact, propeller science is easier to understand than either of the above. In fact, it's easy to figure out the right combination for a boat and its load. The right propeller will place the engine within its prescribed operating ranges at wide-open-throttle. That's important, because it's within the operating range that an engine best delivers its rated horsepower. 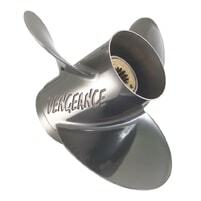 How can you be certain you have the optimum propeller installed on your boat? Simple. Go for a test run. On this particular outing load the boat with the usual complement of crew and gear. If you usually pull skiers, pull skiers. If the decks are usually thick with family, friends, beer coolers and fishing tackle, likewise, bring them along. The idea is to set up the test run to closely resemble the kind of conditions you are most likely to be running. Since propeller pitch is the theoretical distance a wheel travels during one revolution, we can match pitch against actual rpm. and specified operating range to see how well it's working. With the boat loaded appropriately, see how fast the engine revs at wide open throttle. Does the tachometer reading fall within the recommended operating range? If the rpm, do not quite fall into that spectrum, the prop is "over pitched." Which simply means it's taking to big of a bite through the water with each turn of the wheel. Conversely, if engine rpm are higher than the recommended operating range, then the prop is "under pitched". That simply means the engine needs to slow down by taking bigger bite of water with each swing of the propeller. A rule of thumb for incrementing such adjustments is that a one-inch change in pitch will correspondingly change the engine speed by 300 rpm. In theory, replacing an l8-inch pitch propeller with a 17-inch propeller will add about 300 rpm in engine speed. Some typical engine operating ranges fall into about a 1000 rpm. band, there's plenty of leeway in choosing where you want a propeller combination to run. Economy minded marine engineers will "pitch" the package to place the full throttle rpm in the lower end of the recommended range. For example, if the rating is 4500 to 5500 rpm., they might try to hit from 4500 to 4800 rpm. Where snappy acceleration is critical, as in water skiing, pitch low. Prop for the high end of the rpm range at wide-open-throttle. Remember, the skier must be in tow to yield an accurate measurement So with an operating range from 4500 to 5000 rpm, get as close to 5000 rpm as possibly, without over-revving the engine. The magic formula for proping a boat is often the old-fashioned trial-and-error method. So how can a boatman get hands-on experience with a propeller that MIGHT work without having to buy out a dealer's inventory? Luckily, some kind-hearted and savvy marina operators loan out propellers for trial runs. This is especially true if you bought the boat from them and/or are having troubles. The only ground rules being that the wheel come back without cavitation burns, bent blades or slipped hubs. When ready to make a purchase, consider this: Most boats keep a spare wheel in the parts locker. Why not make it one of a different pitch than the one on the prop shaft?. That way the spare wheel does double duty, standing by for a call to action if a log or submerged rock mauls the number one wheel, or to do a better job of yanking a skier out of the water.